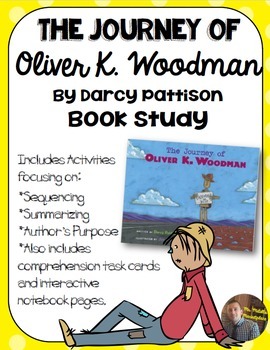 Included in this packet are materials and resources based on the book, "The Journey of Oliver K. Woodman." 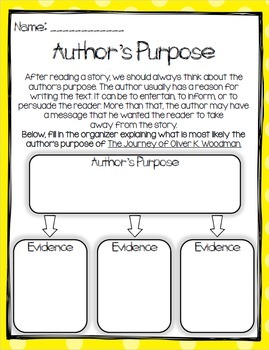 *Graphic Organizers on summary, author's purpose, and sequencing. 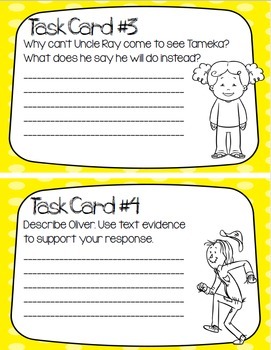 *4 interactive notebook pages to deepen student understanding. There is also an interactive notebook page focusing in on multiple vocabulary words from the story. This is a great story to use as a read aloud for your students, or if you're using a reading series in your school with this story included, this is just a great way to have your students work on some supplemental resources. Tameka invites Uncle Ray, who lives in South Carolina, to visit her in California. Uncle Ray writes back that he can't come, but he is sending a friend, Oliver K. Woodman, a life-size, hinged wooden man that Uncle Ray has carved. Ray puts Oliver by the road with a note asking travelers who pick him up to send postcards to Ray along the way. People are happy to oblige; postcards come from Arkansas, New Mexico, and Utah, revealing a diverse array of travelers and responses to Oliver. Oliver finally arrives, and the journey comes full circle when Tameka's family and Oliver travel (this time by air) to visit Ray.